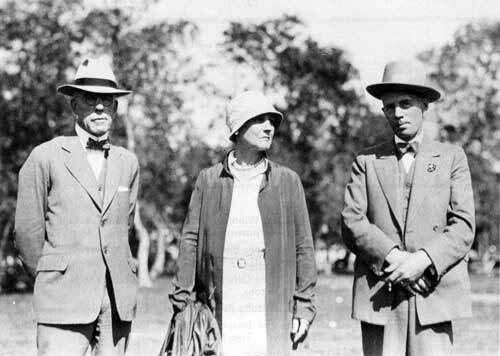 Mr. J. E. Lowry, on right, with Mrs. Lowry and Manitoba Telephone System executive member Mr. J. W. Delaney. When they set out in 1928 to consider possible alternatives to the apparently unsuccessful experiment with private enterprise broadcasting in Canada, the Aird Commissioners took a careful look at examples of government systems in several European countries, especially the BBC in Britain. However, they also had two home-grown models of government-owned radio before them. One was the group of eleven stations owned by the government railway, the CNR, which has received considerable attention from Canadian radio historians as the precursor of the CBC. But the Aird Commissioners also had an opportunity to view another Canadian model of government ownership in 1928, one which has been almost completely forgotten, namely CKY Winnipeg. CKY was not only a government-owned station throughout the twenties but was alsounlike the CNR stations then or the CBC sincea monopoly, and under provincial control. The intention here is to tell the story of CKY in some detail, concentrating on the period up to 1932, and then to discuss some of the implications and conclusions which may be drawn from the short and rather inauspicious history of the only government monopoly broadcasting station Canada ever had. More particularly, the governments most concerned about the jurisdictional question as the broadcasting era began were those of the prairie provinces. There was a very good reason for this, and it was precisely the same reason which impelled the giant U.S. corporation, American Telephone and Telegraph, to get involved in the broadcasting business: fear that radio would compete too strongly with the telephone as a medium of communication. Because the telephone systems in the prairie provinces were government owned and operated, the provincial administrations had a large investment in the communications business which they felt they must protect. It was not really radio broadcasting which they feared so much as the use of radio for sending and receiving private and business messages, thus by-passing their telephone service. Only the Manitoba government, however, carried its concern to the extent of setting up its own broadcasting station to reinforce its claim to control telephonic communications in the province. It appears to me that there is room for only one organization in connection with Radio Telephone Transmission, either on a commercial or entertainment basis, and in view of the necessity of protection this organization should be the Government Telephone System. At that time, early in 1923, there were only two functioning radio stations in Manitoba, both in Winnipeg, operated by the Free Press and Tribune newspapers. In early January 1923 representatives from the papers met with Lowry and agreed to drop out of broadcasting in favour of the MTS. Publicly, they did so with good grace, suggesting that they had found the financial commitment involved in broadcasting more onerous than they had anticipated. Whether or not there was more to the decision is not clear; certainly rumours flew around the city that they had been forced out, and a question was asked in the Legislature to this effect, but there is no hard evidence that anything but a voluntary decision was involved. Indeed Winnipeg radio pioneer George Reynolds, in an article published in 1979, suggested that the newspapers initiated the meeting with Lowry, seeing an MTS takeover of broadcasting as a way for them to get out of an unprofitable business without antagonizing listeners. However it happened, in early March 1923 the Free Press and Tribune closed their stations and the Manitoba Telephone System opened CKY as the province’s only broadcasting station. In the meantime, negotiations with the federal Department of Marine and Fisheries, which regulated radio, had produced an agreement covering the unique status of a provincial government-owned station. Manitoba’s initial idea was that the provincial Ministry of Telephones would assume all responsibility for regulating radio in Manitoba: it would issue licenses for both transmitting and receiving sets, collect the appropriate fees (remitting 10% thereof to Ottawa), enforce regulations against interference and other offences, and in general take over the complete federal authority vis-a-vis radio within the province. This was unacceptable to the federal officials. They insisted that they must retain authority to allocate wavelengths (frequencies) throughout Canada in order to prevent interference across provincial or international borders. Therefore they must also retain the power to issue broadcasting licenses and, to finance that work, must be allotted more than 10% of the license fees. The agreement finally reached, which was enshrined in an exchange of letters and in a May 1923 amendment to the 1913 Radiotelegraph Act, retained overall authority for the federal Department on the crucial matters of licensing and wavelength allocation but gave an unprecedented right to the province regarding the receiving license fee paid by Manitoba radio owners: 50 cents of the $1 fee was to be given to the province to help finance CKY. The more important concession, however, regarded licensing. According to the agreement, federal officials promised that “no licenses will be granted by the Minister of the Department of Marine and Fisheries in respect of radio-telephone stations [of certain classes] ... in the province of Manitoba, until such time as the applications have been approved by the Minister of Telephones in the said Province.”  Thus Manitoba gained veto power over most radio licensing, including that of broadcasting stations, within the province, but not final regulatory control, which remained with Ottawa. I might say that I have never quite appreciated the point of your present policy, insofar as a cast iron monopoly is concerned. You have a first class plant, with all the prestige of a Government institution behind it, you control the telephone lines for ‘out of studio’ broadcasting, and generally speaking possess resources entirely beyond any commercial organization. You do not want to broadcast all the time and there are hours available for other stations. If other people wish to broadcast and will put out programmes of the quality and character of yours, then the people in Manitoba are getting something for nothing. On the other hand, if the private stations do not provide the quality or give as good a programme as you, the comparison would be entirely in your favour and you would make a lot of friends. Therefore, as far as I can see, you have everything to gain and nothing to lose by allowing other people to broadcast. Although considerable correspondence to and fro ensued on this issue, in the end Lowry prevailed, largely because neither Salton nor the Radio Corporation interests chose to pursue the matter. Thus from the spring of 1923 on CKY, owned and operated by the Manitoba Telephone System, had a virtual monopoly of commercial broadcasting in the province. Amateurs were still reluctantly allowed to transmit, as were training schools such as Kelvin Technical High School, and after 1924 a federally-owned CNR broadcasting station, which used CKY’s equipment, was licensed. But no private commercial interests were permitted to compete with the government station. Source: Archives of Manitoba, MTS Collection 60, N17015. There were, however, more cogent criticisms which could be and were made of CKY. First, it was not really necessary for the MTS to go into broadcasting to protect its wire investment. Because of the limited number of frequencies and the absolute lack of privacy, radiotelephony proved not to pose a serious long-term challenge to long distance telephone service as a means of personal or business communication. Secondly, and closer to the heart of the CKY issue, from what can be pieced together of the station’s financial status, it seems clear that Lowry was instructed to operate CKY at a profit, that he did so, and that the pursuit of income greatly affected the station’s programming service. On the station’s inaugural broadcast, premier John Bracken himself made clear that “the intention of M.T.S. was to put broadcasting on a revenue-earning basis as far as possible,” and the Minister of Telephones kept a close eye on the station’s books. CKY had two major sources of earnings. The first, unique to the station, was the 50 cent share of each Manitoba receiving license fee. In 1926, CKY netted about $9,000 from its share of license fees; by 1930 that income had reached over $18,000. In addition, the station was paid a substantial amount (over $14,000 in 1929, for example) by the CNR radio department to rent its equipment for the phantom station CNRW. Despite this revenue, and the fact that the MTS picked up many engineering, equipment and personnel expenses,  costs for artists’ fees and management were high enough that the station would have lost money if Lowry had not sought advertising revenue. In fact, one of manager Darby Coats’s most important tasks was the solicitation of sponsors, and Lowry not only lobbied the Ottawa officials in favour of generous regulatory provisions vis-a-vis advertising but on occasion ignored regulations he disagreed with. In 1926, the station earned about $10,000 from advertising, about half its total revenue; by 1932 the figure was several times larger. Thus, in most years, the station did make a small profit$4,600 in 1926, for example, and $8,870 in 1931. The Minister of Telephones was presumably well pleased. But should he have been? The struggle for profits affected the station’s operations, influenced its programming, and, it shall be argued, undermined the service it gave to the people of Manitoba. This can be illustrated through a brief discussion of the program content of CKY Winnipeg in the 1920s. Like all Canadian radio stations at the time, the Winnipeg station broadcast for only limited hours, gradually increasing its schedule as the decade progressed. Encouraged by Lowry, Darby Coats made a particular effort to deflect criticism of CKY by scheduling what he considered superior programs. 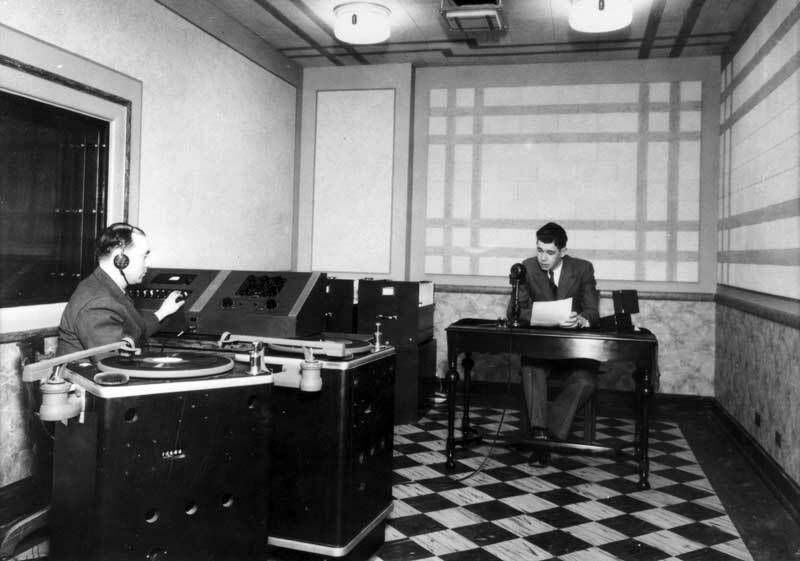 Even before the station went on the air, Coats was in touch with Prof. W. T. Allison, head of the Extension Service of the University of Manitoba, arranging a series of talks on such subjects as “The Elements of Human Nature” and “Modern Ideas of Electricity.” In 1924 the station instituted the first series of lectures broadcast straight from university classrooms. A more practical series for farmers sponsored by the Agricultural College was also initiated; topics included “The Crow: The Farmer’s Friend or Foe” and “The Barbary Bushits Relation to Wheat Rust.” At Coats’s behest, the Winnipeg Board of Trade arranged a number of programs on the attractions of the city and province, and various churches broadcast services on Sunday mornings and some Sunday evenings. Nevertheless, most of the on-air hours consisted of the staple “concerts” typical of the radio of the era, featuring a variety of local artists, and many hours of music brought in from the Roseland Dance Gardens on Portage Avenue. Indeed, Coats reported that he quite deliberately programmed “large doses of jazz” because whenever lectures were broadcast he received listener complaints on the order of “What do you think you’re doing” and “Tell that guy to get lost.”  Coats made little or no attempt to mount more expensive productions like dramas or operas, which the CNR stations presented regularly and even some of the private stations carried on occasion. By the fall of 1927 CKY was broadcasting about forty hours a week, three and a half hours in the daytime and from two to four hours at night, with two silent nights. The forty hours were composed of about five and a half hours (14%) information programming (news, weather, market reports), two and half hours of church services (6%), over six hours of lectures (15%) and more than twenty-two hours of music and concert programs (55%). In comparison, at the same time CKAC Montreal, which shared a channel with two other stations, broadcast about 11% information, 6% lectures and 88% music, while CFCA Toronto, also sharing a channel, presented 21% information, 6% lectures, 2% sports and 60% music and concerts. In general, then, the fare on CKY was much like that on other stations in Canada and the U.S., although the proportion of inexpensively-produced types of educational material was larger. One of the more intriguing experiments at CKY was the practise of picking up and re-broadcasting programs from American stations. As Coats described it in his memoirs, various MTS officials with good radio sets living in different parts of the city were connected to the station by special telephone lines. “When reception was particularly good in his part of the city, one or other would notify the studio. Then, if the local program permitted, the re-broadcast would be announced and substituted.”  Apparently there were no objections from either the American stations or from Winnipeg listeners. More importantly, the MTS evidently had no “cultural” qualms about such an arrangement. As George Reynolds put it: “Lowry was continually extolling the excellence of CKY productions yet if an entertaining program was coming through from Denver, Des Moines or elsewhere, the unpaid CKY artist was unceremoniously bumped off the air.”  In its need to be self-financing, and therefore to be popular, CKY in the 1920s, like the CBC since, found the presentation of American programs an irresistibly attractive option. It is also noteworthy that one of Lowry’s most frequent justifications for the station and its expense was that it provided untold amounts of free publicity about Manitoba and its attractions to businesses and tourists in the United States. Time after time he proudly calculated how many Americans were listening to his station. But had CKY been created for the listening pleasure of the people of Minnesota and North Dakota? In the late twenties CKY’s transmission power and coverage aroused two important controversies which indirectly led to the eventual loss of its monopoly position. In May 1926, Commissioner Lowry wrote to Deputy Minister Johnston in Ottawa suggesting that CKY wished to build a new, much more powerful, 5,000 watt station. Johnston replied that experience indicated that high powered stations “blanketed” a huge surrounding area and prevented reception of any other station, thus arousing considerable listener resentment. Ottawa’s policy, therefore, was to insist that “ordinary licensees” build their transmitters at least fifteen or twenty miles from major population centres (this was later raised to forty). Lowry immediately wired back that he had already picked a location for his new transmitterat the Manitoba Agricultural College, eight miles outside the cityand that convenience for educational use must be the priority. Eventually CKY was granted special permission for this arrangement, on condition that the MTS take full responsibility for any complaints which arose, and because Johnston trusted Lowry to move the station if Winnipeg listeners insisted. 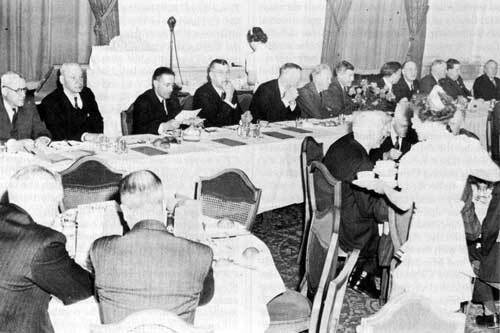 Head table at J. E. Lowry's retirement party, March 1945. Left to right: Dr. Wesley McCurdy, Winnipeg's Mayor Garnet Coulter, Mr. Justice W. J. Major, A. Brown of Northern Electric Company, Hon. William Morton, Guest of Honor John E. Lowry, Peter Miller, Premier Stuart Garson, John Hay of Bell Telephone Company, William Clubb, St. Boniface Mayor George MacLean, Walter Warren. Meanwhile the Premier and other politicians in both Winnipeg and Ottawa were being besieged by letters and petitions from irate residents of Brandon and other points in Manitoba. For the first time the general public joined the radio dealers in protesting against what the Free Press called the “one-man” rule of radio in Manitoba. In August 1927 James Richardson himself had an interview with Premier Bracken on the subject of the Brandon station, but to no avail. In December, 1928, CKX Brandon began operations, for the most part re-broadcasting the programs of CKY Winnipeg. In fact, behind the scenes in Ottawa, and following immediately upon the 1932 judicial decision granting the federal government full authority over broadcasting, a number of decisions had been taken or were about to be taken which meant the end of CKY’s special status among Canadian broadcasting stations. First, it had been decided to end the 50 cent per license subsidy, on the grounds that “it discriminated in favour of Manitoba as against the other Provinces.”  The subsidy was cancelled by P.C. 506 on March 2, 1932 and ceased effective April 1. Secondly, consultations were initiated with the Hon. T. G. Murphy, Minister of the Interior and Manitoba’s representative in the federal Conservative Cabinet, about the whole question of the provincial government’s veto on broadcasting licenses. A memo prepared by C. P. Edwards for a meeting with Mr. Murphy revealed that, as of April 1932, the Radio Branch had nine applications on file for stations in Manitoba, and that more were to be expected if the monopoly provisions were cancelled. As it turned out, resolution of this issue was delayed until after the passage of the Broadcasting Act in May of 1932 and the creation of the new regulatory body, the Canadian Radio Broadcasting Commission (CRBC). Three days later, having consulted with his Minister, Mr. E. Hawken of the Radio Branch informed Commissioner Lowry of the decision, and two weeks later the Richardson station at Middlechurch was granted a license. Despite public protests from the Manitoba government that the large investment of the people of the province in CKY would now go down the drain, nothing could be done. Richardsons immediately closed CJRW Fleming and reopened it as CJRC Winnipeg. Thus CKY’s privileged position had ended. Within eighteen months, in a time of flux for all of Canadian broadcasting, it lost both its subsidy and its monopoly. CKY nevertheless continued under the ownership of the MTS: de facto it became the centre of the CRBC and later CBC western networks, although the relationship with Lowry, especially in the early thirties, was not always a smooth one. The station was finally purchased by the CBC in 1949 and renamed CBW. The call letters CKY were later picked up, and are still used, by a privately owned Winnipeg station. A number of important issues are raised by the CKY experiment in provincial government monopoly broadcasting. Two major questions dominated the early days of radio: how was broadcasting to be financed, and how was it to be regulated. The establishment of a provincial government station was a reasonable solution to the first problem, because receiving license fees were the first and most obvious source of income from radio. As Commander Edwards of the Department of Marine and Fisheries put it in early 1923, many difficulties, particularly of a political nature, might ensue if Ottawa disbursed the license fees it collected to private broadcasters to finance their activities. If the broadcaster were a government, however, such a practice could be much more easily defended. What Edwards subsequently discovered, however, was that Commissioner Lowry was as jealous of his revenues and profits as any private broadcaster, and what’s more was in a position to do more about it. To Edwards’s chagrin, Lowry was able to arguesuccessfullythat in order to protect CKY’s revenues all sorts of special privileges must be granted, most especially the banning of all competing stations. Both East and West dispassionate comment singles out CKY as a warning of what public ownership may be. But “public ownership” is a designation which requires some looking into. To judge from what one hears from this station, CKY is as effectively owned by the advertisers as any confessedly commercial station in the length and breadth of the continent. Surely the nadir of such commercialization is plumbed when Sunday evening is as much given over to ballyhoo announcements as any other night of the week. The provincial government as a whole was partly to blame for what went wrong with CKY. The decision about whether or not a public utility should strive to be self-financing is essentially a political one. At root the question is: who should pay for the service, its users, or the general public through the tax system? In Manitoba in the 1920s less than 30% of homes had radio receivers; asking all taxpayers to subsidize radio service would have been politically unpalatable without a well-considered and strongly-presented case for the cultural importance of broadcasting. Lacking that, CKY had to support itself, which in turn meant inexpensive programming and extensive advertising. The situation was complicated by the fact that CKY was owned by a utility which had its own financial problems and in turn by a government badly in debt. In the end, fiscal concerns outweighed other political or cultural considerations which might have led the Manitoba government to try to make more of the station. In 1923, by granting the Manitoba Minister of Telephones a veto over the issuance of transmitting licenses in the province, Ottawa for the first time agreed to share some of its regulatory power over broadcasting with a province. As subsequent events proved, the arrangement had not been well thought out and was subject to much misinterpretation. Although they never said so explicitly, the federal radio officials by the end of the decade clearly regretted the deal. The evidence available makes it impossible to determine definitively whether Edwards and Johnston came to the conclusion that no provincial monopoly broadcasting could work, or if they had just lost patience with the irrepressible and often irritating Commissioner Lowry. But the Radio Branch officials were certainly not faultless in the matter themselves. Throughout the early years of broadcasting, Ottawa’s consistent policy was to aim for maximum flexibility by introducing as few restrictions, regulations and guidelines as possible so that the growth and development of the art could proceed unhampered. Both the advantages and disadvantages of this approach are revealed in the CKY case. Despite their claim that CKY was subject to federal regulatory authority like any other station, the Ottawa officials in fact granted it a number of privileges, including not only the major ones already discussed but smaller but still significant advantages such as an exemption from paying the standard $50 broadcasting station license fee. The correspondence between Lowry and Ottawa reveals an aggressive Commissioner, always pushing for more, and federal authorities who were clearly becoming increasingly annoyed by the constant demands from Winnipeg. But they had only themselves to blame, for making a vague agreement in the first place, and for “playing it by ear” thereafter. It is evident that the Radio Branch officials were trying to avoid a confrontation with Manitoba over CKY because of the implications this might have for the whole question of which level of government should have jurisdiction over radio. Undoubtedly they carefully discussed every significant step in the station’s regulation, but they lacked an overall conception of what role they foresaw for provincial government broadcasting, and therefore could not help but fail to guide or shape the experiment. For the most part, they simply reacted to Lowry’s initiatives, which as we have seen were flawed themselves. Thus CKY developed in the 1920s, as did Canadian radio broadcasting as a whole, in a policy vacuum. Politicians, whether federal or provincial, showed little interest in radio before the creation of the Aird Commission in 1928, and none at all in its cultural implications. Bureaucrats were left to make policy by the gradual accretion of numerous ad hoc decisions. The CKY story illustrates and confirms historian Kenneth Dewar’s contention that the radio policy of the 1920s, culminating in the 1932 Broadcasting Act, was more a product of a succession of specific responses to changing technical and economic factors than of deeply-rooted political or cultural values or clear-sighted goals. The CKY case presaged the failure of later Canadian politicians to resolve two fundamental questions: what kind of service should a publicly-owned medium of mass communication provide, and how should it be funded? Both issues still bedevil us today. An earlier version of this article was presented to The Association for the Study of Canadian Radio and Television meeting at Winnipeg, October, 1984. The author thanks Gilbert L. Comeault of the Provincial Archives of Manitoba for unearthing some of the CKY material. 1. Implementation of the Aird Report was delayed until 1932, and the original recommendations were altered in the interim. Canada ended up with a mixed broadcasting system with both public and private elements; the public system (the CBC) became centrally dominated without institutionalized provincial input. 2. See especially E. Austin Weir, The Struggle for National Broadcasting in Canada (Toronto: McClelland and Stewart Ltd., 1965). The standard text on the history of Canadian radio is Frank Peers, The Politics of Canadian Broadcasting 1920-1951 (Toronto: University of Toronto Press, 1969). 3. One of the few studies which says much about CKY is George F. Reynolds, “Early Wireless and Radio in Manitoba, 1909-1924,” Historical and Scientific Society of Manitoba Transactions, Series III, nos. 34 and 35 (1977-9), pp. 89-113. 4. Public Archives of Canada (PAC), Records of the Department of Communications, RG 97, vol. 90, file 1024-8 part 1, G. J. Desbarats to the Hon. William Martin, March 14, 1922, Martin to the Hon. G. P. Graham, April 7, 1922, E. Newcombe to Desbarats, April 7, 1922. For evidence that Manitoba officials were aware of the implications of their action, see Public Archives of Manitoba (PAM), RG 11 Al, Public Utilities, Minister’s Office, Box 3, The Hon. F. M. Black to J. E. Lowry, January 15, 1923. 5. PAC, RG 97, vol. 90, file 1024-8 part 1, Desbarats to H. W. Brockwell, May 10, 1922. See also statement of C. P. Edwards, Director of Radiotelegraph Service, in Alan Longstaff, “The Future of Radio in Canada,” Radio (February 1923), p. 20, PAM, RG 11 Al, Box 3, Black to Lowry, January 15, 1923, and PAC, Records of the Department of Transport, RG 12, vol. 864, file 6206-162-3, C. P. Edwards, “Memo to the Minister: Manitoba Broadcasting situation to be discussed with the Hon. T. G. Murphy,” April 26, 1932. 6. PAM, RG 11 Al, Box 3, Lowry to the Hon. D. L. McLeod, September 8, 1922; PAC, RG 97, vol. 90, file 1024-8 part 1, C. P. Edwards, “Memo to the Deputy Minister: Provincial Radio Legislation. Manitoba,” March 8, 1923. 7. PAM, RG 11 Al, Box 3, “Radio Legislation,” January 4, 1923. 8. PAC, RG 97, vol. 90, file 1024-8 part 1, Lowry to Edwards, December 10, 1923. 9. John Kendle, John Bracken: A Political Biography (Toronto: University of Toronto Press, 1979), pp. 37-8. 10. Canadian Marconi Library, Montreal, D.R.P. Coats, “Canada’s Fifty Years of Broadcasting and Stories Stations Tell,” (unpublished manuscript), p. 135. 11. For background on the founding of these stations see Reynolds, “Early Wireless and Radio,” pp. 101-2. 12. Winnipeg Tribune, March 8, 1922. 13. Reynolds, “Early Wireless and Radio,” pp. 106-8. 15. PAC, RG 97, vol. 90, file 1024-8 part 1, C. P. Edwards, “Memo ...,” March 8, 1923. 16. Both sides seriously considered raising the receiving license fee for Manitoba radio owners from the standard $1 to $2, so that the federal government would still net $1 from each. The idea was dropped, however, because the provincial officials quite rightly feared a backlash from Manitoba radio fans. PAM, RG 11 Al, Box 3, Lowry to Black, May 2, 1923, E. Hawken to the Provincial Treasurer, October 20, 1923. The provision to split the license fee entailed an amendment to the 1913 Radiotelegraph Act to allow the federal government to “authorize the payment of a portion of the license fees collected ... to a provincial government, private company, or other prescribed party.” Statutes of Canada, 1923, c. 26. This provision was only ever used in this instance. 17. PAC, RG 97, vol. 90, file 1024-8 part 1, C. P. Edwards, “Memo to the Deputy Minister: Manitoba Government Proposals,” Memo. No. 1, April 4, 1923. This change in regulatory authority did not require an amendment to the Act but was agreed upon by an exchange of letters and published in the Canada Gazette, June 16, 1923. 18. PAM, RG 11 Al, Box 3, Lowry to Black, January 8, 1923 and May 2, 1923; see also PAC, RG 97, vol. 90, file 1024-8 part 1, C. P. Edwards, “Memo ...,” March 8, 1923. 19. For background on Salton’s pioneering activities, see Reynolds, “Early Wireless and Radio,” pp. 100-2. Reynolds is incorrect in suggesting that the Radio Corporation of Winnipeg first sought a license in September 1923 (p. 111); it had been licensed as CHCF since April 20, 1922, although it had never operated. See PAC, RG 97, vol. 90, file 1024-8 part 2, Telegram, Marine to F. P. Varcoe, December 14, 1931. On the cost of erecting the station see ibid., file 1024-8 part 1, G. M. Bell to The Hon. W. R. Motherwell, September 10, 1923, copy. 21. For example, L. V. Salton, “Radio Control or Monopoly in Manitoba: Which?” Radio Bug (July 1923), pp. 5-6. 22. PAC, RG 97, vol. 90, file 1024-8 part 1, A. Johnston to Black, September 22, 1923. 23. Ibid., Edwards to Lowry, December 3, 1923. 24. PAM, RG 11 Al, Box 3, Black to Johnston, October 20, 1923. 25. PAC, RG 97, vol. 90, file 1024-8 part 1, C. P. Edwards, “Memo ...,” March 8, 1923. See also PAC, Records of Royal Commissions, RG 33, Series 14, vol. 5, “Report to British Broadcasting Committee,” May 19, 1923, p. 3. 26. PAC, RG 97, vol. 90, file 1024-8 part 1, Edwards to Lowry, December 3, 1923. 27. See for example, ibid., T. E. Webster to Edwards, December 24, 1923; “Broadcasting in Manitoba,” Radio (January 1924), p. 20. 28. PAM, RG 11 Al, Box 3, Lowry to Black, June 25, 1923. More specifically, by the time of the 1931 Census, almost 30% of Manitoba households had receiving sets, while the proportion in Saskatchewan was 27.5% and in Alberta 25.3%. 7th Census, 1931, Vol. V, Table 57, p. 979. 30. L. Lawrence, “Control of Radio in Manitoba,” Radio Bug (July 1923), p. 7. 31. It is true, however, that the MTS’s activities in broadcasting might have given it some influence in the later battle between telephone and telegraph companies for chain or network con-tracts. By the early 1930s CKY had made itself the central station in a “Prairie Chain” linked by telephone wire. PAC, MG 30 D67, E. A. Weir Papers, vol. 28, clipping, C.E.L. L’Ami, “History of Radio in Manitoba,” Winnipeg Tribune, February 19, 1934. 32. Reynolds, “Early Wireless and Radio,” p. 108: see PAM, RG 11 Al, Box 3, Minister of Telephones to Lowry, June 19, 1923 and October 16, 1923. 33. Department of Marine Fisheries, Annual Report, 1926-27, p. 143 and 1930-31, p. 129. In 1930 the income was shared with the other MTS station, CKX Brandon. 35. PAM, RG 11 Al, Box 3, Lowry to T. J. Brown, October 12, 1923; see also ibid., Black to Lowry, November 15, 1923. 36. PAC, RG 97, vol. 88, Lowry to Edwards, June 9, 1926 and reply June 17, 1926; RG 12, vol. 864, file 6206-162-2, W. A. Rush to G. Gray, Winnipeg Radio Inspector, June 5, 1929. 37. Winnipeg Tribune, February 10, 1927; Winnipeg Free Press, February 17, 1933. 38. Coats manuscript, p. 111 ff, pp. 142-5. 40. “CKY Schedule for Week of October 22,” Winnipeg Free Press, October 22, 1927. 41. CKAC schedules from La Presse, October 24-29, 1927; CFCA schedules from Toronto Globe, October 22-28, 1927. 42. Coats manuscript, p. 168. 43. Weir, “Early Wireless and Radio,” p. 87. 44. Coats manuscript, p. 154. 45. Reynolds, “Early Wireless and Radio,” p. 112. 46. For example, see Lowry to Editor, Radio News of Canada (February 1924), p. 12; PAM, RG 11 A4, Box 3, Lowry to Finance Committee, June 4, 1924 and Lowry to Hawken, November 6, 1923. 47. “Manitoba’s Verdict,” Radio News of Canada (February 1924), p. 11. 48. A few years later, it would probably be fairer to say that local opinion was genuinely divided. The Winnipeg Radio Inspector wrote to C. P. Edwards in 1926: “There are some fans in Winnipeg who would like to hear CKY every evening, and there are others who do not wish to hear them at any time ...” PAC, RG 12, vol. 864, file 6206-162-1, G. Gray to Edwards, February 11, 1926. 49. See PAC, RG 97, vol. 90, file 1024-8 part 1, Gray to Edwards, April 16, 1929 and W. A. Rush to Gray, April 26, 1929. 50. PAC, RG 12, vol. 864, file 6206-162-1, Johnston to Lowry, May 4, 1926. 51. Ibid., Lowry to Johnston, May 11, 1926. 52. Ibid., Johnston to Lowry, May 16, 1928 and Johnston to W. J. Sheppard, November 13, 1928. 53. See Manitoba Free Press, November 10, 1928, and November 15, 1928. See also PAC, RG 12, vol. 864, file 6206-162-2, Lowry to Johnston, November 20, 1928 and E. G. Cass, Secretary Amalgamated Radio Trades Association, to the Minister of Marine and Fisheries, March 16, 1929. 54. Ibid., Lowry to R. H. Snyder, April 8, 1929 (copy); Lowry to Editor, Manitoba Free Press, May 18, 1929. 55. T. J. Allard, Straight Up: Private Broadcasting in Canada: 1918-1958 (Ottawa: Canadian Communications Foundation, 1979), pp. 16-17. 56. PAC, RG 12, vol. 864, file 6206-162-1, Gray to Edwards, May 2, 1927. 57. Ibid., Johnston to Lowry, April 26, 1927; PAM, RG 11 Al, Box 3, Lowry to A. E. McKenzie, April 2, 1927, May 14, 1927 and August 30, 1928. 58. PAM, RG 11 Al, Box 3, Lowry to Paul Dow, March 18, 1927 (copy). 59. Ibid., D.R.P. Coats to the Hon. J. Bracken, March 18, 1927 and Enclosures. 60. Ibid., Lowry to Bracken, May 3, 1927. 61. PAC, RG 12, vol. 864, file 6206-162-1, clipping from Manitoba Free Press, June 1, 1927. 62. PAM, RG 11 Al, Box 3, James Richardson to Bracken, August 16, 1927. 63. PAC, RG 97, vol. 154, file 6206-174 part 1, Lowry to Johnston, February 6, 1928 and Johnston to Lowry, February 11, 1928; RG 12, vol. 864, file 6206-162-1, Gray to Edwards, May 2, 1927. 64. PAC, RG 12, vol. 864, file 6206-162-3, Lowry to Edwards, March 12, 1931 and Edwards to Lowry, March 31, 1931. 65. Ibid., Lowry to Edwards, February 18, 1932; F. McVeigh for the Assistant Deputy Minister of Marine to Lowry, May 16, 1932. 66. Ibid., The Hon. A. Duranleau, Minister of Marine, to the Hon. T. G. Murphy, March 16, 1932; C. P. Edwards, “Memo [re discussion] with the Hon. T. G. Murphy,” April 26, 1932. 67. Ibid., list attached to Edwards’ memo. 68. PAC, RG 97, vol. 90, file 1024-8 part 2, E. Hawken to Lt.-Col. W. A. Steel, November 9, 1933 and Steel to Hawken, November 14, 1933. 69. See Winnipeg Free Press, December 4 and 5, 1933. CJRC was subsequently sold to the Sifton family and renamed CKRC; it is still an operating Winnipeg station. Allard, Straight Up, p. 19. 70. Lowry apparently took exception to the amount of time booked by the CRBC on the station and the rate paid for it; ever the entrepreneur, he would have preferred to sell the time to advertisers. He also deeply resented the CRBC’s decision to lease telegraph rather than telephone wires to link stations for network broadcasts. C.E.L. L’Ami, “History of Radio in Manitoba,” Winnipeg Tribune, February 19, 1934. 71. See references cited in footnote 5. See also PAC, RG 97, vol. 151, file 6206-108 part 1, Johnston to J. N. Cartier, November 14, 1923. 72. “Mr. Coats was of the opinion that Mr. Lowry was taking advantage of CKY to help swell the telephone earnings, and the money received from Ottawa (the half of the Manitoba license fees) was being used to improve the telephone system rather than radio conditions.” PAC, RG 12, vol. 864, file 6206-162-1, Gray to Edwards, May 2, 1927. 73. Editorial, “CKY,” Winnipeg Free Press, January 15, 1931; see also Editorial, “C.K.Y.,” Manitoba Free Press, May 13, 1929. 74. This assumes that the case for operating a broadcasting station in order to protect telephone revenues was not a particularly compelling vote-winner either. 75. See, for example, PAC, RG 33 Series 14, vol. 5, “Report to British Broadcasting Committee,” May 19, 1923, p. 8 and House of Commons, Special Committee on Radio Broadcasting, 1932, p. 111. 76. PAC, RG 12, vol. 864, file 6206-162-1, Johnston to Lowry, April 22, 1925. 77. Kenneth C. Dewar, “The Origins of Public Broadcasting in Canada in Comparative Perspective,” Canadian Journal of Communication, January, 1982), 26-45. This viewpoint contrasts with the strong emphasis on the cultural values of Canada in the 1920s to be found in the work of such influential radio historians as Frank Peers, op. cit., and Margaret Prang, “The Origins of Public Broadcasting in Canada,” Canadian Historical Review, 46 (1965), 4.